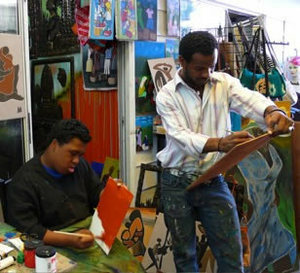 As a child growing up with Downs Syndrome, it was the nurturing of Haile's parents, followed by his neighborhood and learning communities, that imbued him with the tools and confidence to experiment and grow in the arts. His extraordinary view of the world - perhaps because of his condition - at the same time, manifests in the richly expressive colors, forms, and subjects that identify his art. According to a DSE (Downs Syndrome Education) article on Creative arts, imagination and expression, persons with Downs Syndrome experience deep feelings they may express eloquently through visual and performing arts, but otherwise find difficult to communicate. With exposure to quality arts experiences, an outlet in which to produce, and the expectation that they can, the results can be transformative. Haile, who turns twenty-six on Saturday, has exemplified this for more than ten years through paintings that reflect his sense of family, global concerns, his love for music, and the village that raised him. He has also studied martial arts and loves drumming, but painting is where Haile's artistry really shines. The family would discover this when they paired him with professional artist, Carl Thelemaque, as a young teenager (pictured below). The Learning Tree Preparatory School provided the most valuable foundations of Haile's academic and artistic development. He went on to study at the Art Students League of New York and Harlem School of the Arts (HSA), and has privately studied with artists Carl Thelemaque of Haiti, Reynaldo Davidson of Jamaica, and Donald Babatunde Eaton. His combined Latin, Caribbean and African heritage features prominently in his paintings, which revolve around a variety of themes of personal, sentimental value. 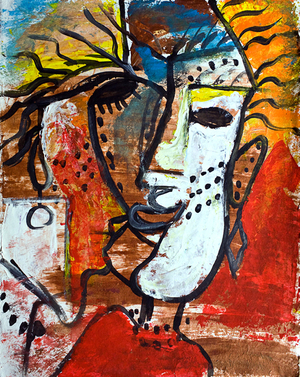 While vestiges of cubism, surrealism, dadaism or abstraction are evident in some of Haile's compositions, the artist isn't reaching toward any particular style. 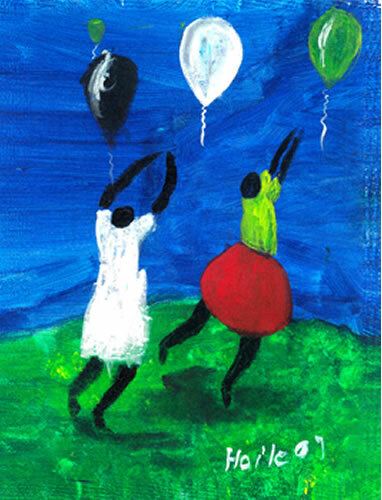 Whether capturing the childhood glee of chasing balloons, the festive spirit of Caribbean carnival, or a fearsome movie character that captivated his imagination, Haile's art is an unadulterated outgrowth of his heart. 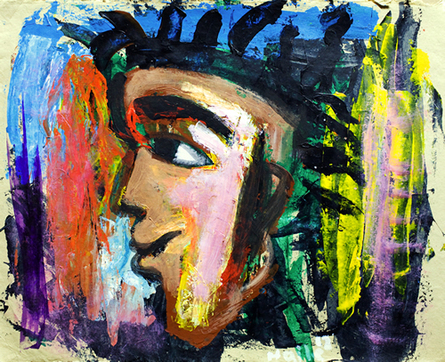 This purity of expression has reigned in viewers and supporters of Haile's work since the beginning: It is the same element found in the works of Thornton Dial, Jean Michel Basquiat, Picasso, and others who created outside the box. In many respects, Haile is just like any other artist. Haile has exhibited throughout New York City and received recognition from some of the city's highest local officials and institutions; including Mayor Michael Bloomberg, Congressman Charles Rangel, and The Studio Museum in Harlem. More importantly, he has used his creative voice to support the efforts of organizations working to raise awareness about Downs Syndrome and the richness of the lives of persons living with it, like himself. Some of his outstanding accomplishments include a public art commission for the Harlem River Park Project, fundraising through the arts for Haitian earthquake victims, and four paintings in the permanent collection of the Pediatric Unit at New York's Mt. Sinai Hospital - an institution that saved his life. 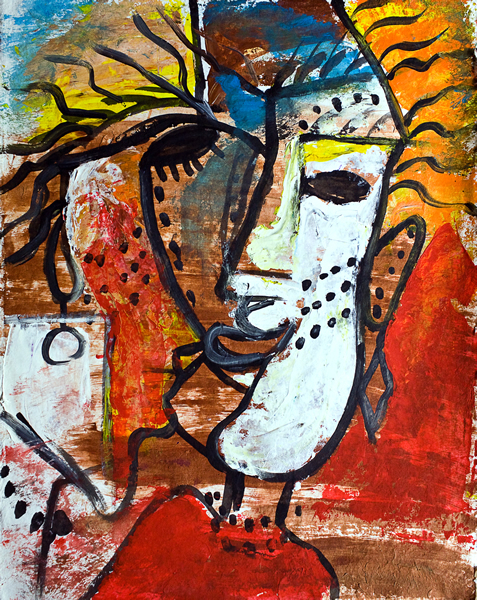 On Saturday, May 14, 2016, New Harlem Besame Restaurant - owned by Haile's father, Bernardo Rubie - opens a new exhibition of the artist's latest works. The opening reception will also double as the 26th birthday celebration for Haile, whose special day is a robust tradition celebrated by his family and a lifetime community of friends who know him for his loving and creative spirit. While Haile's art has adorned the restaurant walls since its opening last year, this new installation marks a push in the family's efforts to expose, market, and sell the art. Limited Edition giclées of dozens of works are becoming available for sale, and a coffee-table book - featuring images of Haile's art and his triumphant story - is in production and expected out this Fall. The current exhibition will remain on view at Harlem Besame throughout 2016. New Harlem Besame Restaurant is a bustling family-owned establishment featuring traditional Latin, Caribbean, Soul Cuisine and cocktails. The restaurant realizes its passion for the arts, the neighborhood, and the diaspora through elements of décor including historic photographs, an impressive African Mahogany mural from Liberia (which tells the story of the African migration to America and back to Liberia), and the showcased works of local visual and performing artists. The reception is free to attend and begins at 3pm on Saturday, May 14th at New Harlem Besame, 2070 Adam Clayton Powell, Jr. Blvd., New York, NY 10027. RSVP recommended. All images of Haile King-Rubie and his art appear courtesy of the Rubie family. Visit hailesimo.com for more information and to view additional art.